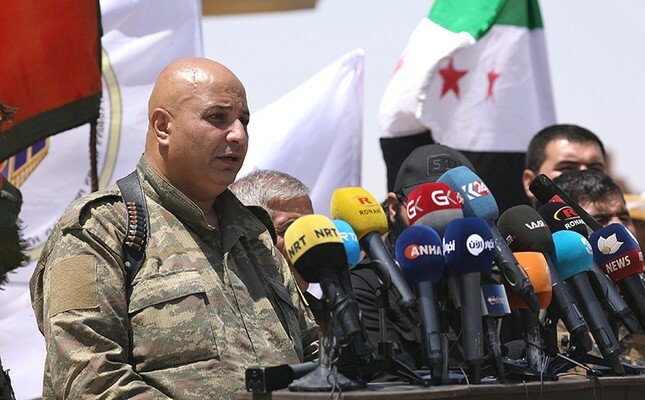 Talal Sillo, a high-rank commander and acting spokesperson of U.S.-backed Syrian Democratic Forces (SDF), defected from the PKK-aligned group and crossed into Turkey from Free Syrian Army-held Jarablous, reports said Wednesday. Sillo was a brigadier general in the SDF, which is largely made up of the People's Protection Units (YPG), the armed wing of PKK terrorist group's Syrian offshoot Democratic Union Party (PYD). Sillo's defection was also confirmed by Rudaw, a news network based in Iraq's Kurdistan Regional Government (KRG) and aligned with President Massoud Barzani. Based on local sources, Turkey's official Anadolu Agency also reported that Sillo left the group for an unknown reason. It added that YPG's former spokesperson Redur Khalil was appointed as the SDF's news spokesperson, once again proving the ties between the two groups. Activists and the Britain-based Syrian Observatory for Human Rights also reported Sillo's defection. Sources within the SDF told the Observatory that Sillo has not been reachable since Tuesday. Ahmad Ramadan, spokesman of the Istanbul-based Syrian National Coalition opposition group, said in a tweet that "with the help of the Free Syrian Army, Brigadier Talal Silo has defected... and reached the Jarablus region." Born in Aleppo in 1965, Sillo served as an officer for several years in the Syrian army in the 1990s. After being discharged, he joined the SDF following the group's establishment in 2015. The development comes soon after the end of the grueling campaign to seize Raqqa from Daesh.